Thailand: cheap open-jaw flights to Bangkok from Europe from €228/£184! British Airways flights to New Zealand from Sweden €546 (£453) – London exit possible! Cheap return flights from Germany to Japan from €284! New amazing solution based on promotional deal Gulf Air is available! This time you may book very cheap open-jaw flights to Bangkok in main tourist season 2016/2017! To book the cheapest fare available you would have to look for departures from Istanbul with return back to Germany (Frankfurt) or UK (London). Such an open-jaw flights are available for just €228 or £184… All charges and fees are included in base fare. (As well as 30kgs checked luggage). Istanbul is connected with other European cities by many low-cost airlines. If interested in this deal with Gulf Air please look for flights in travel period between October and 16th of December 2016 and from January till end of March 2017. Valid for bookings made till 30th of July 2016 or until sold out / fixed. Max stay 4 months and latest date of your return flight from Bangkok has to be 31st of May 2017. We have managed to find the cheapest flights throughout whole validity of the tariff. We are also adding some travel date samples below. In some cases you may find routings with long layover in Bahrain. This is great opportunity to visit another culture on your way. Gulf Air belongs to one of the airlines offering free hotel during layonver. (Or in this case greatly discounted accommodation as the booking class is “W”). More details to be found here. Please refer to below booking samples if interested in this great option to visit South East Asia in peak season 2016/2017 for such a low fare.. Thanks to extremly high competition in Thailand you may find all the kind of service for really cheap price. On the other hand Bangkok as well as whole Thailand offers also super luxurious 5* hotel chains. It is just up to you once you arrive there which service you choose but the fact is that Thailand still remains one of the most rewarding destinations for casual tourism. This is indeed great opportunity to book cheap flights to Thailand during next main tourist season for such a reasonable price! Great fares can be found through booking sites such as Hotels.com..(however we are confident you will not have any issue to find cheap accomodation right after your arrival to Bangkok). 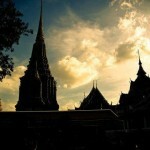 Booking sample to Thailand: cheap open-jaw flights to Bangkok from Europe from €228/£184! in main tourist season 2016/2017 below. In this case you would be departing from Istanbul to Thailand on 20th of January 2017. Your return flight from Bangkok to London would take place on 10th of February 2017.